The New York Knicks are doomed. Losing in Game 1, at home, to the Indiana Series means they have no chance to come back and claim the conference semifinal series. It doesn’t have anything to do with field goal percentage, Carmelo Anthony shooting, offensive rebounding or scoring in the paint. History paints a much simpler picture – the Knicks get knocked out whenever they lose Game 1 at home. It’s not such a hard thing to comprehend. Having home advantage and having it snatched away on the opening day of the series might have disastrous results, especially when it’s a team that’s not that much better than its opponent and relies mostly on the scoring of one individual, who has to face one of the few players (Paul George) who has the length and upper body strength to trouble Anthony for an entire game while not sending him to the line. The Knicks are 0-5 in postseason series in which they lose the opener at home. It began in 1959, when only three teams from each division (the NBA had 8 teams) made the postseason. The Boston Celtics, the number one seed, had a first round bye, while the Knicks played in a best of 3 series against the Syracuse Nationals. The Knicks lost 129-123 in the series opener, as Dolph Schayes scored 35 points and lost the second one 131-115. In 1969 the Knicks finished with the third best record in the East (the NBA had 14 teams by then), and swept the Baltimore Bullets in the first round. In the Eastern finals, they met the Boston Celtics, the defending and almost perennial NBA champions at the time, although at the end of their dynsaty with Bill Russell. The Celtics also won six games less than the Knicks during the regular season. It didn’t matter. Boston took the opening game 108-100 despite 34 points from Walt Frazier and 24 from Willis Reed, eventually taking the series in six games, advancing to win the series and the NBA title, beating the Lakers in 7 games. Next time was in 1981, with the NBA being a 23 team by now, with four postseason series to win in order to claim the title. In the first round, being the fourth seed, the Knicks hosted the pre-Michael Jordan Chicago Bulls. They lost 90-80 in the opener and went on to lose the series 2-0. 1989 – Da Bulls, again. The Knicks were led by Patrick Ewing, and finished second in the Eastern conference with a 52-30 record. They easily swept the Philadelphia 76ers in the first round before setting up a meeting with the Chicago Bulls and Michael Jordan in the conference semifinal. The Bulls came to New York and won 120-109, leaving back to Chicago with the series tied at 1-1. The Bulls went on to win games 3 and 4, lose game 5 and win game 6, with Jordan scoring 40 points in the clincher, and at least 34 points in five of the games. In 1995 came the last time the Knicks couldn’t come back from losing the opener. One of the great rivalries of the 90’s was with the Pacers, beginning in the previous year. 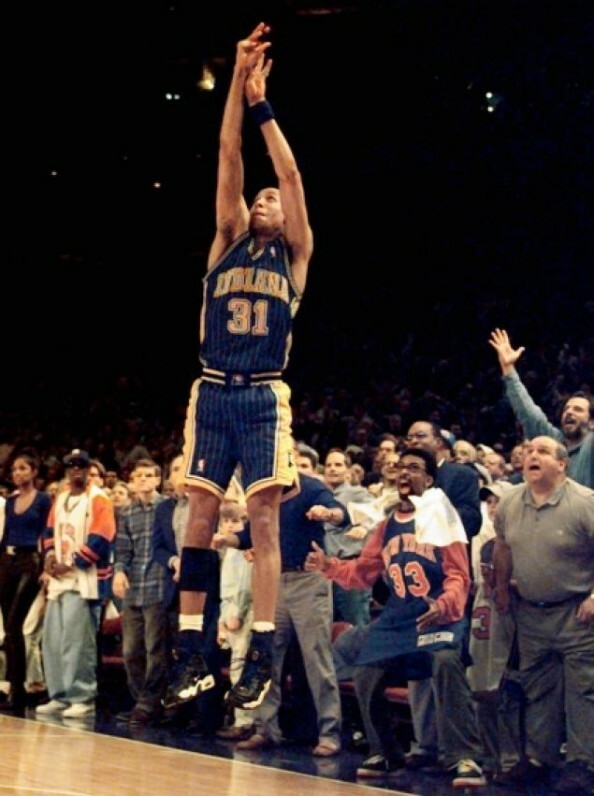 The Knicks reached the conference semifinals to meet Indiana, the Central division champs, and met Reggie Miller at his finest, losing 105-107 in the opening game with Miller scoring 8 points in 18.7 seconds. The Knicks went on to lose in 7 games.